What do you get when you combine a classic novel, a hidden object game, and The Rocky Horror Picture Show? Well, in the case of Frankenstein – The Dismembered Bride, you get something of a mess. A straight-up port of a PC hidden object game, Frankenstein – The Dismembered Bride has you guiding newlywed Brad through a spooky mansion to help rescue his missing bride, Janet, who unfortunately, has been chopped up into pieces by Dr. Frankenstein. Luckily for them, Dr. Frankenstein is the kind of crazed genius who can do this kind of thing without killing a person, so Janet is fine, just in need of her missing body parts and a ton of stitches. I’m a little embarrassed to admit it, but I’m a huge hidden object game fan. I’ve played dozens, if not hundreds of them, but I’ll be the first to admit that they’re all generally the same. You have lots of cluttered rooms and a list of objects you need to find. Frankenstein is a little better than others in that most of the clutter is perfectly appropriate to the scene, but the list of objects you need to find is still pretty unmotivated. Why do you need to find a seagull, a green pencil, and three vases? Shouldn’t you be looking for, ya know, an arm or something? I don’t know, just do it! Ridiculous conventions of the genre aside, Frankenstein is still only typical for its kind. 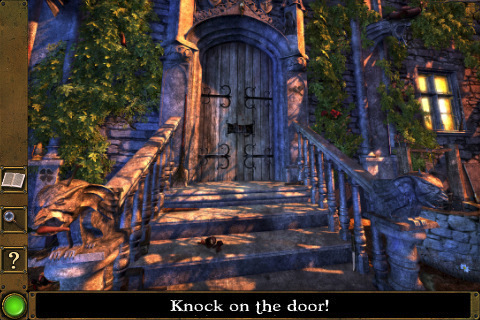 While the environments may have been perfectly reasonable for a PC game, on the iPhone screen they come across as extremely dark, cramped, and difficult to see. You can pinch zoom, but it can be frustrating trying to get around this way. It’s a bad sign when the game has to suggest you turn up your brightness settings all the way, and my eyes were definitely starting to ache before the end. The game is also on the short side and entirely linear, something which veteran hidden object fans may get frustrated with. It’s certainly not the worst of its kind, but Frankenstein is lacking in the bold visuals and charming characters sought by fans of Where’s Waldo, and it’s without the deep story and additional puzzles sought by fans of The Stone of Destiny. It’s not the best example of the genre, but diehard hidden object fans will still probably enjoy the moody environments and the cheaper price tag, if they can put up with a bit of squinting. AppSafari review of Frankenstein – The Dismembered Bride was written by Tracy Yonemoto on April 25th, 2010 and categorized under App Store, Games, Puzzler. Page viewed 4044 times, 1 so far today. Need help on using these apps? Please read the Help Page.